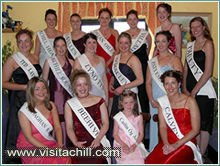 The Seafood Festival was established in 1993 and is one of the highlights of the year on Achill. Local restaurants, already well known for the quality of their seafood dishes, will often provide special menus for the Seafood Festival. A gala dinner provides first class entertainment along with the freshest of Atlantic seafood. The Seafood Festival also heralds the start of the Achill Yawl Festival, which begins in July and runs throughout the summer until September. These traditional wooden sailing vessels provide a direct link to Achill's maritime heritage. The Cailín Acla competition, a local talent contest, is staged during the Achill Seafood Festival. This event provides a high standard of entertainment and glamour as local girls compete for the prestigious title (see picture, left). The Achill Seafood Festival also offers an opportunity for anglers - both local and visiting - to take part in competitions. Achill's Atlantic waters provide some of the best sea angling in Europe. Some 34 species of fish have been caught in Achill waters, including blue shark. The Achill Seafood Festival is a celebration of the rich harvest of the sea in the waters around Achill. Visit the Féile Bia Na Mara / Achill Seafood Festival website.